RAFAH, Egypt - Some of them are said to be big enough to accommodate railroad cars. They may reach a depth of 50 feet, and are reported to be equipped with cables and electric motors that move food, fuel, and probably some of the heaviest rockets that Hamas aims at Israel. The tunnels also are one of the main reasons fighting is continuing in the Gaza Strip. As Israeli officials debate how far to press their campaign in Gaza, one of their chief goals is to find a way to crimp or halt the flow of arms to Hamas through a complex of tunnels under the territory's border with Egypt. While ground forces battle Hamas in the streets, Israeli warplanes pummel targets in Gaza near Rafah, the coastal town that straddles the Gaza-Egypt border. Israel's demand to block arms shipments through the "Philadelphi corridor," the strip of land separating Gaza and Egypt, is a central point in cease-fire talks. "A preponderance of weapons have come through those tunnels," said a senior US military official who has seen classified intelligence reports on Hamas arms flows. 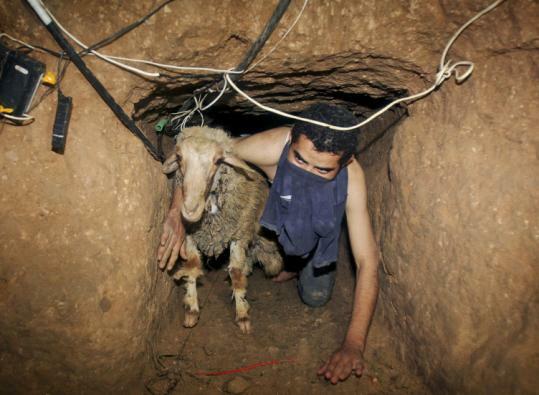 For residents of Gaza, however, the tunnels bring far more than arms. The territory's borders have largely been sealed since Hamas took control in 2007. The tunnels are the main conduit for normal commerce and a lifeline for food and medicine. Smuggling through the tunnels is also a primary source of income for Bedouin tribes long neglected by the central government. One smuggler, who gave his name as Abu Mohammed, said gasoline and food make up the bulk of his business. Palestinians involved in cease-fire negotiations want to see the overland border with Egypt reopened. On the Israeli side, military officials and politicians see the blocking of the tunnels as a prerequisite to any cease-fire. "We must reach, at the end of the war, a situation in which this arms smuggling is stopped," Yossi Peled, a general in the Israeli reserves and former head of the Israeli Defense Force's northern command, said last week on Israeli radio. "If we do not achieve this, then one might very well ask why it was that we embarked on this war to begin with." Shutting the tunnels by military force alone is likely to be difficult. Israel had only limited success even when it controlled the Gaza Strip. Analysts who have been briefed on Israeli intelligence say the tunnels have become more elaborate in the three years since Israel pulled out of Gaza. A US government study issued in 2008 reported that Egyptian officials have privately acknowledged that between 10 and 30 main tunnel shafts run underneath the border at any one time. Long-range Iranian-made missiles, such as the Grad rockets that struck Ashkelon in May 2008, are relatively large weapons that could only be moved through tunnels of considerable scale, according to a former Pentagon official. Some of the tunnels are large enough to run railroad cars under the border, according to people briefed by Israeli officials, although it's unclear whether rail cars are used. Wealthy families in Rafah allow their private homes or rental properties to be used as tunnel openings, which are then rented out to Hamas gunrunners, according to the 2008 report compiled by the Congressional Research Service. Packages of arms and ammunition are pulled by cables and electric motors. Mohammed said that Israel's air strikes had damaged up to 60 percent of the tunnels, but that the damage can be repaired easily. He said the tunnels range in depth from 12 to 15 yards, and that Israeli missiles can only penetrate to a depth of about 7 yards. As a result, US and Israeli analysts say any effort to shut down the tunnels is likely to focus on a diplomatic agreement with Egypt, which has shouldered the responsibility for policing the border crossing since Israel's withdrawal from Gaza. Mohammed said about 6,000 people are connected to the smuggling business on Rafah's Egyptian side, including traffickers, tunnel diggers, and shop owners. Shutting this trade down, especially in a nation where more than 40 percent live on less than $2 a day, could lead to antigovernment protests. Egypt says it has drastically reduced the amount of smuggling. But it says current agreements with Israel permit only 750 Egyptian border guards to monitor the crossing. Egypt has agreed to spend $23 million of its annual US military aid on advanced detection equipment, including sensors and remote-controlled robots.